Lake Mohave is a 67 mile stretch along the Colorado River in Arizona. 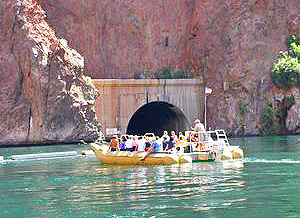 It is part of the Lake Mead National Recreation Center where there are many recreational opportunities. It has 237 miles of shoreline that are sunny virtually year-round. Picturesque limestone cliffs and sandy beaches surround the lake, making it a place unlike anywhere else. Some of Lake Mohave's unique beaches can only be accessed by boat. The water temperature ranges from 54° to 84° F.
Lake Mohave is near Bullhead City, Arizona, and Las Vegas, Henderson, and Overton, Nevada. The lake is surrounded by the Pyramid, Painted, Eldorado, and Black Canyons, giving it a secluded feel. The lake is only about 4 miles wide and is a perfect place to swim, water ski, canoe, or fish. The main fish found in the area are Largemouth Bass, Striped Bass, and Rainbow Trout. The backdrop of canyons behind Lake Mohave makes it a wonderful place for photography. 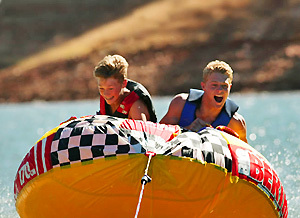 The Cottonwood Cove Resort and Marina is a family-friendly getaway located at the center of Lake Mohave. It consists of a motel, a swimming beach, an RV Park, and a campground. The Spanish-style red-roofed motels come with outdoor patios complete with BBQs for a relaxing meal outdoors. The marina provides services such as houseboat rentals, a gift shop, and convenience store, boat slip rentals, ski and fishing boat rentals, and a dry storage facility. The Cottonwood Cove Cafe is right next to the gift shop. The marina also has a boat, motor home, and trailer hauling service for your convenience.